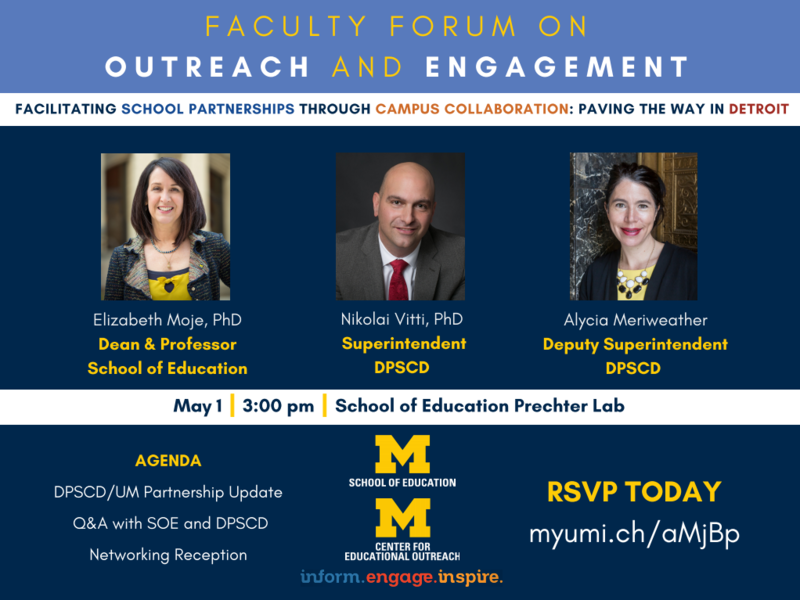 Part of the Office of Diversity, Equity and Inclusion, the Center for Educational Outreach (CEO) supports and advances the University of Michigan’s commitment to educational outreach and academic excellence. CEO partners with faculty, staff, and students to develop and implement programs that inform, engage, and inspire a diverse community of scholars. Communicating with students about educational options after high school is a critical step to address issues of access and equity in postsecondary education. Navigating through the variety of options can seem overwhelming and the college application process can be daunting and complex. The process of obtaining financial aid is also a significant barrier to entry for many students and inhibits them from pursuing postsecondary options for which they are qualified. However, these factors should not be deterrents, and addressing this issue is one aspect of our work at the Center for Educational Outreach. Research has continually demonstrated that “informational interventions” significantly increase the likelihood of students pursuing postsecondary options by addressing the misconceptions that many students hold and by bridging the resource gap. Informing students about the options, resources and support available to them in their educational journey is a key component of our mission. Developing a college-going culture among youth is essential for making postsecondary education more accessible. College aspiration does not happen overnight; this mindset and belief must be cultivated through meaningful and effective engagement. For many students, especially those from underrepresented backgrounds, information about college is provided only sporadically and without structure. Research has shown that having college plans by the tenth grade increases students’ likelihood of attending by 21%, compared to plans created during the twelfth grade. Providing students with opportunities to engage with ideas and explore academic disciplines and career paths is an important way to help students prepare for life after high school graduation; this can have a significant impact on their aspirations. At the Center for Educational Outreach, we seek to engage students, schools and communities in a variety of ways to promote access to and success in postsecondary education. The idea of college can seem daunting. This is especially true for students who have not received the challenge and support necessary to develop the sense of confidence that promotes academic achievement and college readiness. Moreover, research has continually demonstrated that the ability to envision oneself thriving in a particular environment–developing a sense of belonging–is a powerful motivator. The Center for Educational Outreach strives to promote opportunities to challenge students academically, encourages schools and communities to develop support systems, and leverages the University of Michigan to provide the resources and inspiration that help students see they belong in college and can succeed.